Over ten years ago now I happened to buy a CD on eBay, and that was an opportunity to become friends with a person. Years of ebbing and flowing e-mail exchange and we still have not met face-to-face, but it feels that we know a lot about each other by just talking. The man lives in Sudbury, Ontario, and often the topic of our conversation was the relative desolation of the place in the Northern part of this Canadian province, and the weather which accompanies such location. It is from this gloomy northerly setting comes to us Finnr’s Cane, the trio led by The Bard aka Darren Favot (my friend really has to check if there is any relationship here). 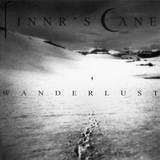 Between dense guitars, fitting drum patterns and cello snippets, Finnr’s Cane uses post-black/shapeless atmpospheric postrock approach to draw landscapes I am sure one would see around Sudbury in just about any time of the year. There is definitely room in Wanderlust to go completely acoustic, from the quiet pensive Antimatter-like opener The Healer to rustic folk-touched Green Carnation styled beginning of The Lost Traveller to cold and withdrawn Glassice. In just about every case, the band manages to increase their guitar volume and thickness, making it glide as one ethereal mass over the top of rising/falling rhythmic chords (Snowfall) or become bombastic in its abrasive warning (The Lost Traveller). At times somber and funeral (Snowfall), the band has its own hard-to-hide bouts of anger (A Winter of Shut-Ins) or tragic serene depression which come after some clamoring and blasting (The Hope for Spring). Sometimes distorted to painful levels the music on Wanderlust can swing from ominous to hopeful in the span of one composition. With vocals very much pushed into the background, so they are barely heard as mopey whispers, the band follows no blueprints as to how these compositions unfold, seemingly sliding along the quirky emotional path completely rudderless. This music is not for a sunny day, made for deliberations be it in a shimmering frosty cleanliness or suffocating guitar anxiety. Finnr’s Cane are masters at building up pressure (double bass wall in House of Memory), but their resolution of it is often abrupt and unexpected. More chamber and claustrophobic than Wolves in the Throne Room, definitely a lot less euphoric than Alcest and less focused and more commotion and chaos oriented than Agalloch, the fans of the aforementioned bands would do well for themselves to check out this Canadian debutant.